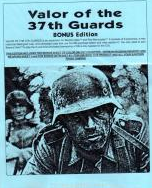 This expansion for Advanced Squad Leader (ASL) contains 9 scenarios and a Campaign Game on a large hex map of the Dzerhezinsky Tractor Works. (Ownership of Red Barricades is required to play this game). The northernmost of three huge factory complexes along the Volga, the Dzerhezinsky Tractor Works was an extended cluster of warehouses, office buildings and assembly halls built with the help of the Ford Motor Company in the 1930's to improve Soviet farming with modern tractors. The factory itself was bordered by an oil storage facility and worker' housing units. At the outset of the war with Germany, the factory was hastily retooled to make the soon-to-be-famous T-34 medium tank. The steel ribs of the workshops stuck out amidst enormous mounds of rubble. The German 14th Panzer and 389th Infantry Divisions pounded the Guardsmen and smashed into the workshops of the factory itself for the first time. The factory had been busy, building and repairing tanks to the end, and the last T-34 tanks produced went into action unpainted. Now men cut each other down in brutal firefights staged at arm's length in the broken halls of the factory, while tanks sent shells crashing through the gloomy workshops in showers of sparks.